The EQUALIZER-TURBO provides ride-through compensation for all three-phases at 0.3pu, voltage dip ΔU 70% for a typical duration of 2 seconds, with no limitations place on voltage swells. Clients may also specify an even longer duration to meet their individual requirements for production. 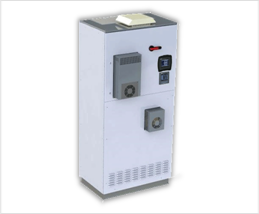 This ride-through capability easily resolves almost all the voltage disruptions in rural areas and developed countries. In addition the device restores the voltage to 1.0pu of its nominal value (+-15%). Due to independent phase compensation, the EQUALIZER-TURBO can correct each phase accurately and independently. EQUALIZER-TURBO comes with integrated software monitoring system with event notification and remote access facility. Each EQUALIZER-TURBO is custom designed to suit specific network environments. The environments typically includes connection from the utility substation with maximum loads, line impedances & transformers. Elspec will give you the confidence to effectively manage your network environment in order to meet all your energy consumption needs. We do this by conducting a comprehensive survey prior installation, that includes continuous measurements for a substantial period, that will identify all the PQ events for this period. The aim is to ultimately eliminate power outages, voltage fluctuations & other PQ anomalies. Based on the analysis we produce an analysis that will ultimately guarantee a good return on your investments.